It has been conjectured that Flemish composer Jean Mouton was in charge of the musical festivities by the French at the meeting between François I and Henry VIII at the Field of the Cloth of Gold, which took place between 7 to 24 June 1520 in a valley subsequently called the Val d’Or, near Guisnes to the south of Calais. 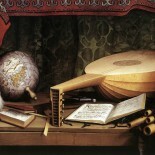 This is an example of a painting and composer brought together by an event, though not necessarily at the same moment. This entry was posted on December 20, 2013 by renaissanceartandmusic in Video Pairing.